Welcome to the first installment of our A Shrimpy Journey through 2019 Crypto series! In this series we’ll be following five individuals making their first foray into markets at the heart of the longest crypto winter to date. Despite the ongoing bear market, our brave individuals have never been more interested in entering the crypto markets. Although they each possess a different degree of knowledge and understanding of cryptocurrencies and blockchain, they firmly believe that cryptocurrencies are here to stay. Let’s take a close look and introduce our five new crypto users who are embarking on a journey into cryptocurrencies: Bitcoin Brian, Ethereum Eddie, Conservative Connie, Altcoin Alice, and Index Isaac. Despite having a vested interest in the future of cryptocurrencies, our new crypto users do not come from a financial or trading background. As regular people with full-time jobs, lives to live, and families to take care of, our new cryptocurrency owners have decided to use Shrimpy to help automate and manage their crypto portfolios. With previous experience managing their 401Ks and other mutual funds, our new crypto users like the idea of employing a similar index and rebalancing strategy to manage their cryptocurrency portfolio as well. They do, however, have different preferences as to how they want their cryptocurrency portfolios constructed and managed. We’ll be introducing each of our new crypto profiles and their respective portfolios below. We begin by introducing our first crypto user profile Bitcoin Brian. Bitcoin Brian believes that Bitcoin is the future of digital money. Despite the plethora of cryptocurrencies available in the market, Brian is a Bitcoin maximalist and believes in first-mover advantage. Although his portfolio comprises mainly of Bitcoin, he has decided to allocate a small portion of his portfolio into Ethereum, which makes a strong case as an alternative to Bitcoin. Bitcoin Brian’s cryptocurrency portfolio is comprised of 75% BTC, 25% ETH. Our second crypto user profile is Ethereum Eddie. Unlike Bitcoin Brian, Ethereum Eddie likes Ethereum, where he initially was exposed by the sudden explosion of CryptoKitties. Despite the constant stream of “Ethereum alternatives” being created, Ethereum Eddie believes that Ethereum still has a huge advantage due to its popularity in the developer community. Ethereum Eddie also decides to include Bitcoin in his portfolio, as he isn’t quite sure about the endless sea of altcoins. 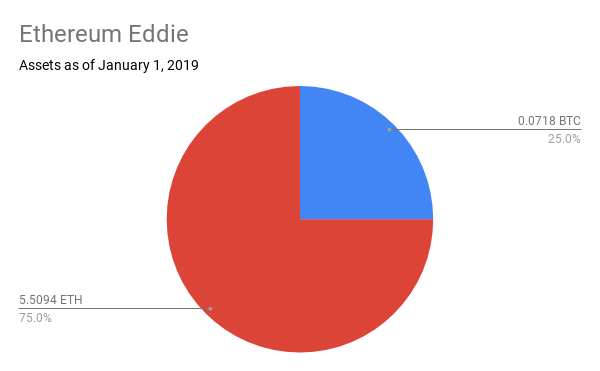 Ethereum Eddie’s cryptocurrency portfolio is comprised of 75% ETH, 25% BTC. Next up we would like to introduce Conservative Connie. Conservative Connie isn’t that interested in cryptocurrencies, but she’s been hearing nonstop chatter from her friends Bitcoin Brian and Ethereum Eddie about the exciting opportunities presented by cryptocurrencies. Compared to her friends Bitcoin Brian and Ethereum Eddie, Conservative Connie is completely new to cryptocurrencies. After a length discussion with both Bitcoin Brian and Ethereum Eddie, Conservative Connie is convinced to allocate a small amount into cryptocurrency, and constructs a portfolio comprised of 50% Bitcoin (BTC) and 50% Tether (USDT) to start her crypt journey. The fourth crypto profile we’ll be following is Altcoin Alice. Altcoin Alice initially heard about Bitcoin back in 2013, but didn’t pay attention to it. In 2017, she was introduced to Ethereum, but also didn’t give it much thought. Having “missed out” on several previous opportunities, Alice decided to learn more and educate herself about all things crypto, but quickly fell deep into the crypto rabbit hole. Today, Altcoin Alice is ALL about altcoins and their potential upside. Altcoin Alice decides to construct an equal-weighted portfolio of high market-cap cryptocurrencies, comprising of Monero (XMR) , Ripple (XRP) , Stellar (XLM), EOS, and Tron (TRX). Our last crypto user to be introduced is Index Isaac, who is best friends with Altcoin Alice. Unlike Altcoin Alice, Index Isaac only heard of Bitcoin, Ethereum, and other cryptocurrencies when crypto markets peaked in 2017/2018. While he may not be as knowledgeable as Altcoin Alice when it comes to cryptocurrencies, Index Isaac has experience in the traditional financial services sector. Index Isaac thinks that actively trading crypto markets would be a recipe for disaster, and decides to emulate a passive indexing strategy, but for his cryptocurrency portfolio. 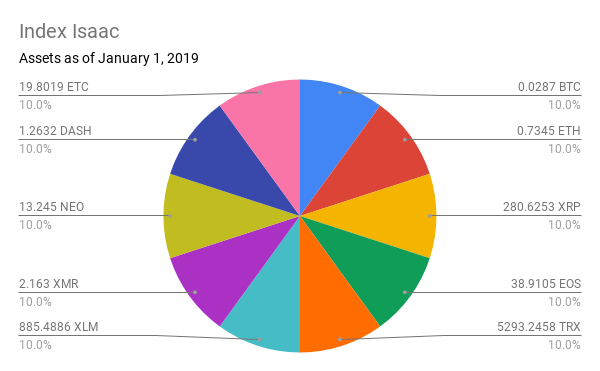 Index Isaac chooses to construct an equal-weighted crypto index of 10 high-cap cryptocurrencies, comprised of Bitcoin (BTC), Ethereum (ETH), Ripple (XRP), Monero (XMR), Stellar (XLM), EOS, Tron (TRX), Stellar (XLM), DASH, and Ethereum Classic (ETC). Now that we’ve introduced our five new personas and their respective portfolios, this concludes A Shrimpy Journey through 2019 Crypto: New User Profiles. Stay tuned for our updates, where we’ll be tracking these portfolios to share updates, unique insights, and in-depth analysis. See how these portfolios stack up to one another as we follow our new cryptocurrency owners as they make their first plunge into the crypto scene! 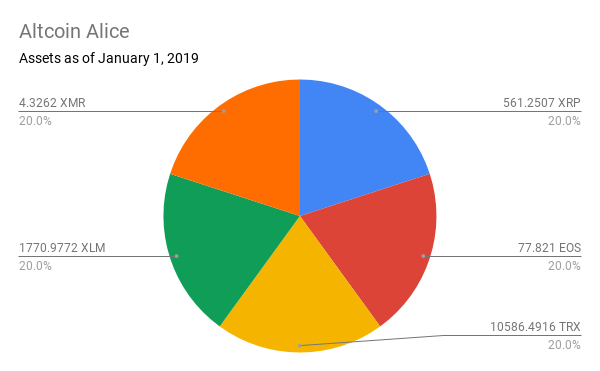 Note: All cryptocurrency prices/rates were obtained using CoinMarketCaps’ open price on January 1,2019 00:00:00 GMT .